In summer 2013, the Kansas City Modern Quilt Guild held a quilt pattern contest among its guild members. The submitted patterns were incredible! We would have loved to develop them all into patterns. 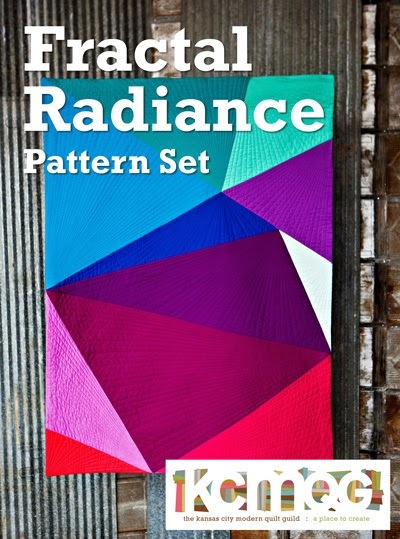 Without further ado, here is the winner: Fractal Radiance Pattern Set by Katie Larson for the KCMQG! This pattern originally started as a pillow I made for my friend Lindsay who likes bold colors and patterns. I liked the way it turned out so much that I decided to enlarge it as a small quilt for myself. It was a challenge to determine how to accurately cut out the large triangles, but I think I came up with a method that works well and isn’t too complicated. I love that it’s simple yet dynamic, and because there aren’t a lot of pieces, it goes together fairly quick. I was so excited to find out this design was chosen to become a pattern, and have learned a lot in the process. I hope you enjoy the pattern, and can’t wait to see what you come up with! Be sure to join the Fractal Radiance Flickr Group and show off what you make! IMPORTANT: After you complete your purchase via PayPal, you will need to click on the link that returns you to the KCMQG site. Your PDF pattern download link will be waiting there. Be sure to download your pattern immediately and save it as a PDF to your computer or mobile device. Proceeds from the purchased pattern will go towards KCMQG programs and activities that encourage modern quilt making and collecting. April’s Guild Meeting- Special Guest!